At the heart of your car or truck is its engine. The engine is a complex system vital to your car that must be maintained properly as even with proper maintenance, an engine can breakdown. Some of those breakdowns are serious and expensive while others are not. At Performance Automotive we use the latest computerized diagnostic equipment to help us pinpoint precisely what is going on with your car. So if you have a dashboard light come on, come see the experts who can tell you on exactly what needs to be done. Our computer system plugs right into your car and gives us important information about your car to help us shorten the diagnosis and repair process getting you back on the road sooner. You know that sickening feeling of indecision. 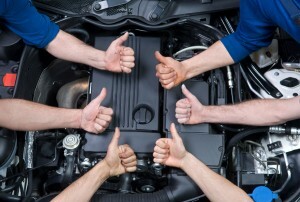 What is the best choice – new car, a newer used car, or a junkyard engine? There is a reliable and much less costly option. A JASPER Re-manufactured Engine is your best solution! Drive train components re-manufactured by JASPER are as good as or better than new but a much less costly solution than replacing your good old four-wheeled friend!